Display in mobile phones A display device is an output device for presentation of information in visual or tactile form. Traditional television and video displays use cathode ray tubes (CRT). Flat panel displays encompass a growing number of technologies enabling video displays that are lighter and much thinner than traditional displays, these are usually less than 4 inches (100 mm) thick. Flat panel displays balance their smaller footprint and trendy modern look with high production costs and in many cases inferior images compared with traditional CRTs. 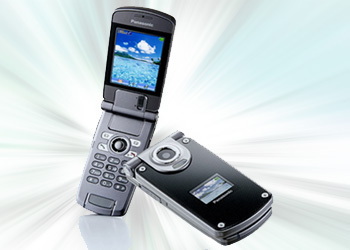 In many applications, specifically modern portable devices such as laptops, cellular phones, and digital cameras, whatever disadvantages are overcome by the portability requirements. Volatile flat panel display of LCD Flat panel TVs are much thinner and lighter than televisions with picture tubes. Organic light–emitting diode displays (OLEDs). Bistable nematic liquid crystal displays Static flat panel displays rely on materials whose color states are bistable. This means that the image they hold requires no energy to maintain, but instead requires energy to change. 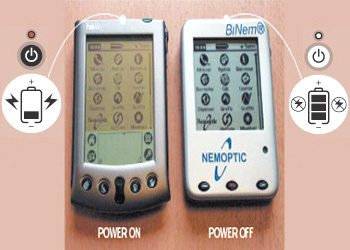 Bistable nematic liquid crystal displays. 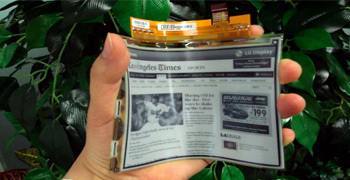 Bistable flat panel displays are beginning deployment in limited applications (Cholesteric displays manufactured by Magink, in outdoor advertising; electrophoretic displays in e–book products from Sony and iRex; and bistable liquid crystal displays from ZBD in store shelf labels). 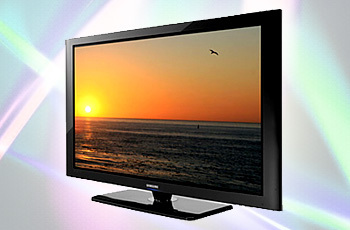 Large–screen television technology developed rapidly in the late 1990s and 2000s. Various flat screen technologies were developed and released in the market – Liquid crystal display (LCD), plasma display panel(PDP) and Digital Light Processing (DLP). These technologies have displaced cathode ray tubes (CRT) in the television space, mainly because of its bulkiness and increasing popularity of flatter televisions. However, recent technologies like Organic light–emitting diode (OLED), Surface–conductionElectron–emitter Display (SED) or Field Emission Display (FED) are making their way to replace the first flat screen technologies in term of picture quality. The diagonal screen size of a CRT television is limited to about 40 inches because of the size requirements of the cathode ray tube, which fires a beam of electrons onto the screen, creating a viewable image. A larger screen size requires a longer tube, making a CRT television with a large screen (50 to 80 inches) unrealistic. The aforementioned technologies are much more suitable for large–screen televisions because they yield television sets that are much thinner in terms of depth. Dot–pitch of the LCD The dot pitch rating of a monitor tells you just how sharp the displayed image will be. Display size: This refers to the diagonal length of the display and usually specified in inches. Display resolution: This refers to the number of pixels in each dimension on a display. In general a higher resolution will yield a clearer, sharper image. Dot pitch: This measures the size of an individual pixel, which includes the length of the subpixels and distances between subpixels. It can be measured as the horizontal or diagonal length of a pixel. 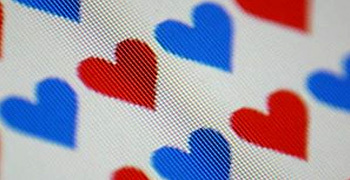 A smaller dot pitch generally results in sharper images because there are more pixels in a given area. 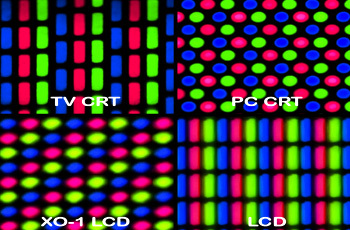 In the case of CRT based displays, pixels are not equivalent to the phosphor dots, as they are to the pixel triads in LC displays. Projection displays that use 3 monochrome CRTs do not have a dot structure, so this specification does not apply. Response time of a LCD Display Response time is the amount of time a pixel in an LCD monitor takes to go from one value to another and back again. Response time: This is the time it takes for the display to respond to a given input. For an LC display it is defined as the total time it takes for a pixel to transition from black to white, and then back to black. A display with slow response times displaying moving pictures may result in blurring and distortion. Displays with fast response times can make better transitions in displaying moving objects without unwanted image artifacts. Brightness: This is the amount of light emitted from the display. It is sometimes synonymous with the term "luminance", which is defined as the amount of light emitted in a given area and is measured in SI units as candela per square meter. OLED Display OLEDs can provide brighter, crisper displays on electronic devices and use less power than conventional light-emitting diodes (LEDs) or liquid crystal displays (LCDs). Contrast ratio: This is defined as the ratio of the luminance of the brightest color to the luminance of the darkest color on the display. High contrast ratios are desirable but the method of measurement varies greatly. 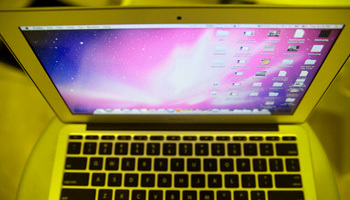 It can be measured with the display isolated from its environment or with the lighting of the room being accounted for. Static contrast ratio is measured on a static image at some instant in time. Dynamic contrast ratio is measured on the image over a period of time. Manufacturers can market either static or dynamic contrast ratio depending on which one is higher. Aspect ratio: This is the ratio of the display width to the display height. The aspect ratio of a traditional television is 4:3, but there is an increasing trend towards the 16:9 ratio typically used by large–screen, high–definition televisions (HD TV). Viewing angles of LCD The angle is measured from one direction to the opposite direction of the display, such that the maximum viewing angle is 180 degrees. Viewing Angle: This is the maximum angle at which the display can be viewed with acceptable quality. The angle is measured from one direction to the opposite direction of the display, such that the maximum viewing angle is 180 degrees. Outside of this angle the viewer will see a distorted version of the image being displayed. The definition of what is acceptable quality for the image can be different among manufacturers and display types. Many manufacturers define this as the point at which the luminance is half of the maximum luminance. Some manufacturers define it based on contrast ratio and look at the angle at which a certain contrast ratio is realized. Color reproduction/Gamut: This is the range of colors that the display can accurately represent. 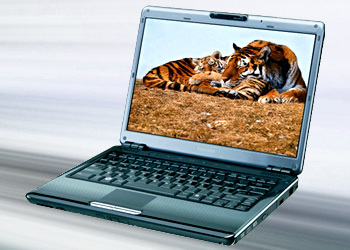 Mechanism of LCD The liquid-crystal display has the distinct advantage of having a low power consumption than the LED. It is typically of the order of micro watts in comparison to the order of milliwatts for LEDs. 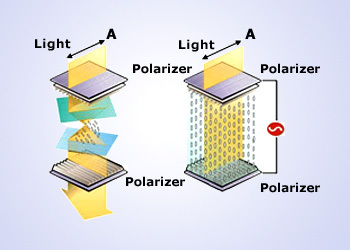 A pixel on an LCD consists of multiple layers of components: two polarizing filters, two glass plates with electrodes and liquid crystal molecules. The liquid crystals are sandwiched between the glass plates and are in direct contact with the electrodes. The two polarizing filters are the outer layers in this structure. The polarity of one of these filters is oriented horizontally, while the polarity of the other filter is oriented vertically. The electrodes are treated with a layer of polymer to control the alignment of liquid crystal molecules in a particular direction. These rod–like molecules are arranged to match the horizontal orientation on one side and the vertical orientation on the other, giving the molecules a twisted, helical structure. Twisted nematic liquid crystals are naturally twisted and are commonly used for LCDs because they react predictably to temperature variation and electric current. LCD Technology They have become very common and have taken a giant leap in the screen industry by clearly replacing the use of Cathode Ray Tubes (CRT). CRT draws more power than LCD and are also bigger and heavier. 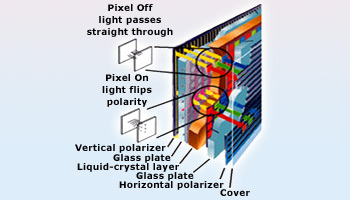 A pixel on an LCD consists of multiple layers of components: two polarizing filters, two glass plates with electrodes and liquid crystal molecules. 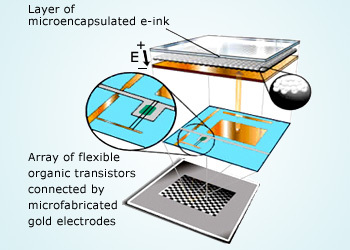 The liquid crystals are sandwiched between the glass plates and are in direct contact with the electrodes. The two polarizing filters are the outer layers in this structure. The polarity of one of these filters is oriented horizontally, while the polarity of the other filter is oriented vertically. The electrodes are treated with a layer of polymer to control the alignment of liquid crystal molecules in a particular direction. These rod – like molecules are arranged to match the horizontal orientation on one side and the vertical orientation on the other, giving the molecules a twisted, helical structure. Twisted nematic liquid crystals are naturally twisted and are commonly used for LCD&apos;s because they react predictably to temperature variation and electric current. Pixels on different display technologies LCDs with high resolutions, such as large-screen LCD televisions, require an active-matrix structure. The electrodes on one side of the LCD are arranged in columns, while on the other side they are arranged in rows, forming a large matrix that controls every pixel. Each pixel is designated a unique row–column combination, and the pixel can be accessed by the control circuits using this combination. These circuits send charge down the appropriate row and column, effectively applying a voltage across the electrodes at a given pixel. Simple LCDs such as those on digital watches can operate on what is called a passive–matrix structure, in which each pixel is addressed one at a time. This results in extremely slow response times and poor voltage control. A voltage applied to one pixel can cause the liquid crystals at surrounding pixels to untwist undesirably, resulting in fuzziness and poor contrast in this area of the image. 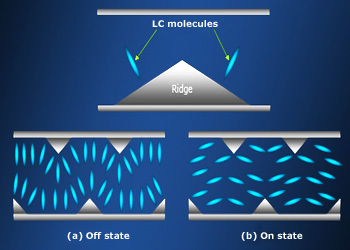 LCDs with high resolutions, such as large–screen LCD televisions, require an active–matrix structure. This structure is a matrix of thin–film transistors, each corresponding to one pixel on the display. The switching ability of the transistors allows each pixel to be accessed individually and precisely, without affecting nearby pixels. Each transistor also acts as a capacitor while leaking very little current, so it can effectively store the charge while the display is being refreshed. Twisted Nematic Display The twisted nematic effect (TN-effect) was a main technology breakthrough that made LCDs practical. Unlike earlier displays, TN-cells did not require a current to flow for operation and used low operating voltages suitable for use with batteries. This type of display is the most common and makes use of twisted nematic–phase crystals, which have a natural helical structure and can be untwisted by an applied voltage to allow light to pass through. These displays have low production costs and fast response times but also limited viewing angles, and many have a limited color gamut that cannot take full advantage of advanced graphics cards. These limitations are due to variation in the angles of the liquid crystal molecules at different depths, restricting the angles at which light can leave the pixel. Mechanism of MVA This technology results in wide viewing angles while boasting good contrast ratios and faster response times than those of TN and IPS displays. Unlike the electrode arrangement in traditional TN displays, the two electrodes corresponding to a pixel are both on the same glass plate and are parallel to each other. The liquid crystal molecules do not form a helical structure and instead are also parallel to each other. In its natural or "off " state, the molecule structure is arranged parallel to the glass plates and electrodes. Because the twisted molecule structure is not used in an IPS display, the angle at which light leaves a pixel is not as restricted, and therefore viewing angles and color reproduction are much improved compared to those of TN displays. However, IPS displays have slower response times. IPS displays also initially suffered from poor contrast ratios but has been significantly improved with the development of Advanced Super IPS. In this type of display the liquid crystals are naturally arranged perpendicular to the glass plates but can be rotated to control light passing through. There are also pyramid–like protrusions in the glass substrates to control the rotation of the liquid crystals such that the light is channeled at an angle with the glass plate. This technology results in wide viewing angles while boasting good contrast ratios and faster response times than those of TN and IPS displays. The major drawback is a reduction in brightness. Patterned Vertical Alignment (PVA): This type of display is a variation of MVA and performs very similarly, but with much higher contrast ratios.